What happens with unbelievers after death? I write this article to continue answering the question I have been asked about the destiny of people after death. I have written an article before, entitled What happens with Christians after death and The destiny of good people who have never heard the message of the Gospel. In this article I propose you to look at the text of the Holy Scripture to see what is the destiny of people who heard the message of the Gospel of the Lord Jesus Christ, had the possibility and were urged to read the Bible, or they even read it, but refused to believe and to enter a covenant with the Lord Jesus Christ. What is the destiny of these people after their physical death? It is absolutely clear from this passage that Hades is in contrast with heaven and it is a place where people descend, somewhere very deep, as the whole Scripture confirms. The rich man lived his life ignoring the faith in God. In Hades, he was in agony and in torment and if anyone touched his lips with the tip of the finger dipped in water, it would have cooled off his tongue. 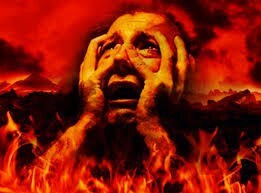 So, Hades is a place where those who rejected the faith are in agony in flame. So, there is no one who lived his life in such a way to be saved in the day of judgment. This is the destiny of the people who rejected the faith in the Lord Jesus Christ, the Son of God who was sacrificed for their sins. Do not be an unbeliever. Look for the Bible, read and believe the words of God to be saved. Tell all your friends, relatives, colleagues and all people. Tell them about the Lord Jesus so that they may be saved and may not go to that place of torment.